By the 1860s, the suburban development of Westcombe Park had begun in earnest (see Maps 4 and 5, dating from 1866 and 1869 respectively). Westcombe House had been demolished in 1854 and in the 1860s several large villas were being built along Westcombe Park Road (only a few of these early Victorian houses now survive, next door to John Roan School’s Westcombe Park Road site, and near the corner of Ulundi Road) . To the north of the Woodlands, in 1840, on the east side of Vanbrugh Hill, the parish workhouse and infirmary has been built, the site later occupied by the Greenwich District Hospital from the late 1960s until its demolition in 2010. And on the west side was Tyler New Town, a dense network of two-storey terraced streets built from the 1840s by local contractor William Tyler (who had from time to time rented some of the Woodlands behind Maze Hill). Nevertheless, the railway to Greenwich (first opened in 1836) was not extended eastwards to Maze Hill Station and beyond, until 1878. Map 4 1866: Williams Lodge has been constructed to the west of Vanbrugh Hill (still known as Green Lane), on a site now covered by numbers 1 and 2 Lasseter Place. Please note the green shaded area shows the current boundaries of the Westcombe Woodlands. 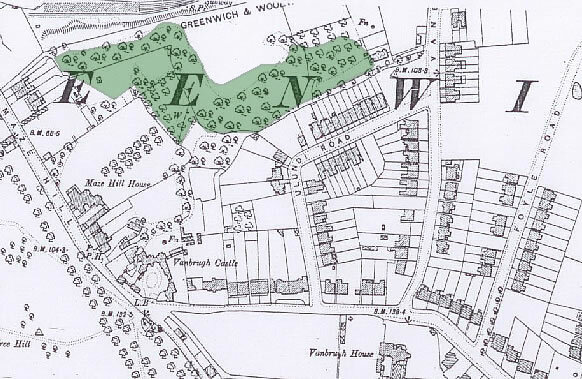 Although the land around was becoming increasingly developed, the 1863-65 Ordnance Survey (shown in Map 4) shows just one major building in the Woodlands, identified as “The Woodlands”, with a lodge house – Williams Lodge (No 31 Vanbrugh Hill) – on the site of what is now Nos 1 and 2 Lasseter Place and the adjacent gate into the Woodlands, directly to the north of the back gardens of Nos 49 and 51 Ulundi Road. The Lodge took its name from William Williams, a milkman of Billingsgate Street, Greenwich, who must have kept his cows there but let the house from time to time. There is census evidence of two small cottages here in 1871 but nothing can be identified and they may have been behind No 53 Maze Hill or thereabouts. 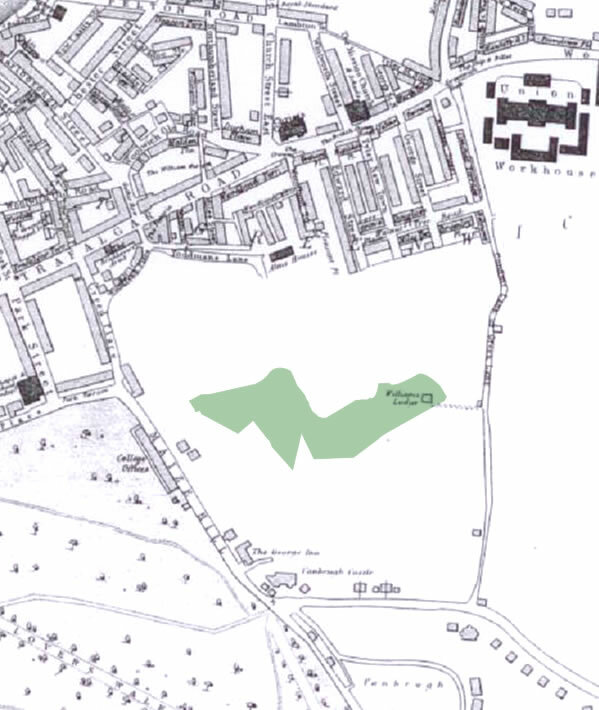 Map 5 1869: A larger house (called Woodlands) is now shown on the site of Williams Lodge. 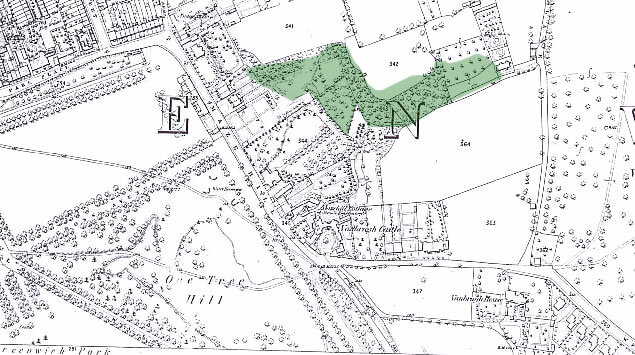 This detailed Ordnance Survey map shows in some detail that the Westcombe Woodlands were a mixture of dense woodlands, formal gardens, orchard and small holdings. The fences between the narrow strips of land just south of plot 341 are still visible today as a zig-zag path in the north-west corner of the Westcombe Woodlands. Please note the green shaded area shows the current boundaries of the Westcombe Woodlands. Both “The Woodlands” house and Williams Lodge must have been built early in the 1860s when Morden College trustees granted a lease (running from 1852 for 75 years) to estate agent and surveyor William Latham Wheeler. Wheeler’s house was a large a larger rectangular house, with two projecting bowed bays with views over the Thames to the north. To its front was a substantial parterre garden boasting a fountain. Some of the wild woodland areas were landscaped with paths, kerbing and ornamentations. The flat area to the immediate west of Woodlands was laid out as an orchard with regular lines of trees, but a few yards further west the steep slopes of the former gravel pits prevented any landscaping. Woodlands House was first occupied by the Wheeler family but by 1881 had passed to marine engineer, John Smith. The smaller lodge building was, usually, tenanted by milkmen. All in all a rather gentler, and more manicured, landscape than the overgrown woodland on the site today. However, there was a rather more grisly side to the site, not mentioned by the estate agents – it was a common suicide spot in Victorian times, with one victim being discovered by a Matilda Wheeler, while perambulating in her father’s garden. On a happier note the gardens were much used for garden fêtes for charitable purposes and for Sunday school treats at the turn of the 19th/20th centuries. After John Smith left in 1884 the house was taken by W S Manning and from 1893 to 1904 by dairyman, Frank W Goddard, who was rated for the house, stables and a dairy. The last private resident seems to have been one James Gurney. Development of Ulundi Road and Vanbrugh Hill began in 1879 and 1881 respectively and by 1897 most of the houses that now stand on both roads had been built (see Map 6). Assuming it was built no earlier than 1864 Woodlands House stood for little more than 60 years: and it was empty by 1920. Fortunately, a photographer perched on the top of the new power Station on the waterfront in 1906 pointed his camera southwards and captured the only picture we have of this extraordinary house: once described as a “cottage” – some cottage! Map 6 1897: Woodlands House has lost much of its grounds as the development of Ulundi Road and Vanbrugh Hill is almost complete. Please note the green shaded area shows the current boundaries of the Westcombe Woodlands. The buyer of the building in 1921 was the Greenwich District Infirmary and it used The Woodlands as a Nurses’ Home. But it was demolished by 1928, shortly after the Morden College lease expired. The block of nurses’ housing (now known as Woodlands Heights) had been built in 1926-1927 and formally opened by HRH Princess Mary, Viscountess Lascelles, in October 1927. 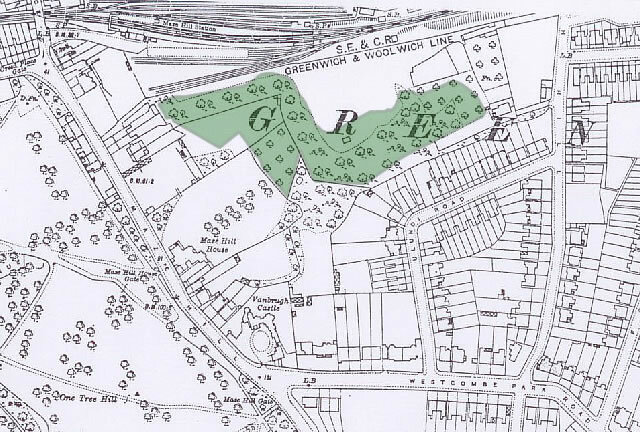 By that date, the land was no longer subdivided as it had been previously and most of what is now Westcombe Woodlands – a zigzag shaped piece of land along the steep slope of the old gravel pits – seems to be a single unit, although the flatter areas at the eastern and western ends of the site still seem to be in informal garden use by some of the neighbours (see Map 7). By the time the hospital authority acquired it, the land enjoyed the oddly serpentine shape it has now. Map 7 1916: Maze Hill House and Woodlands are still standing – for now. Please note the green shaded area shows the current boundaries of the Westcombe Woodlands.